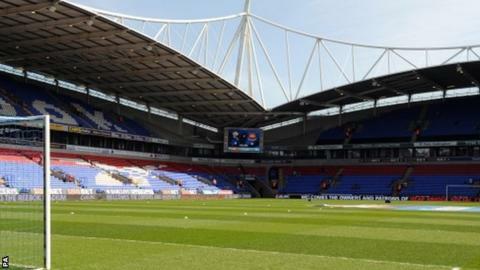 Bolton Wanderers' financial situation is "increasingly perilous", according to the Championship club's recently-appointed advisor Trevor Birch. Owner Eddie Davies is not prepared to invest any more money while the club is for sale, and negotiations led by Birch have so far failed to secure a buyer. "The club's position is increasingly perilous and new investment is needed quickly," said Birch. Players were not paid last month "due to a short-term funding issue". Davies is willing to write off Bolton's £172.9m debt in order to push through a deal for the Championship's bottom side. "We are continuing to negotiate with interested parties but unfortunately no one party has demonstrated all the requisite elements needed to conclude a deal," said Birch, who is leading the negotiations after chairman Phil Gartside fell ill.
Former Bolton striker Kevin Davies said the club had been "totally mismanaged from the top" by being so "heavily reliant" on one benefactor. "They must have known this day was going to come," he said. "He's obviously not putting any money in now and there's no money anywhere else. You have to question who is doing the budgeting." Davies added that believed without a buyer, the club could be in administration "by the end of the week" - to which Birch replied that the club was "continuing to negotiate with various interested parties". Bolton's parachute payments following relegation from the top flight three years ago run out at the end of the season and manager Neil Lennon has struggled to bring in new players given the financial constraints. Birch and representatives of the Professional Footballers' Association met with Bolton's players on Tuesday to outline the situation. PFA chief Gordon Taylor told BBC Sport he was "working to keep the players involved" with the ongoing situation at the club, and added that a deal to buy the club was needed "soon". Birch added: "The players remain upbeat and committed to doing all they can to help the club through this difficult time." Bolton drew 1-1 with Brentford on Monday night and afterwards Lennon told BBC Radio Manchester: "I think something like this can make you stronger. "A couple of wins will change the whole landscape of things, but it's getting those wins. We keep knocking on the door and just falling short."